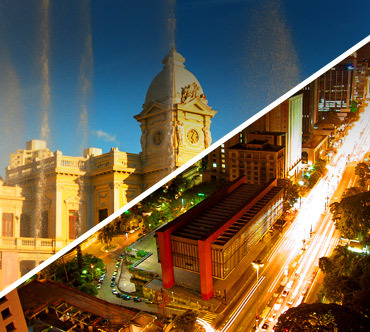 Enjoy your bus trip to Sao Paulo and get to know Brazil like never before! Sao Paulo is the largest city in Latin America and one of the most important economic, financial and cultural center in the world, making it one of the top tourist destinations of residents and foreigners in Brazil. Known as the city that never sleeps, Sao Paulo charms its visitors with its many tourist attractions for all ages and gender. Places like MASP, Pinacoteca, Museum of Portuguese Language, Afro Brazilian Museum are a sign of cultural and artistic riches that surround this city, additionally, Sao Paulo has places like Ibirapuera's Park for those who want to feel nature, take a walk or exercise within an accelerated life and buildings view of the city. Sao Paulo is also characterized by its nightlife, like in Vila Madalena, the bohemian neighborhood perfect for those who enjoy the party environment. Vila Madalena has four main streets, with galleries, cafes, bars and shops that become it a meeting point for people of all styles, making it an iamazing place. All year! 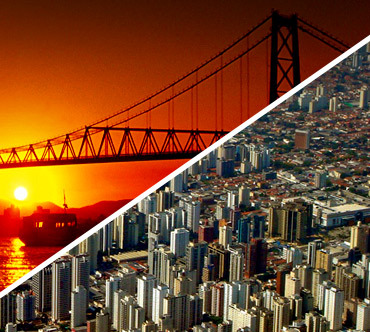 São Paulo's climate is subtropical, with an average annual temperature of 19 degrees Celsius, with cool winters and summers with moderately high temperatures, increased by the effect given by the high concentration of buildings. The warmest month is January and the coldest month is July. Throughout the year, the city hosts cultural events, food fairs, art exhibitions, and festivals that reflect its multiculturalism in each month of the year. 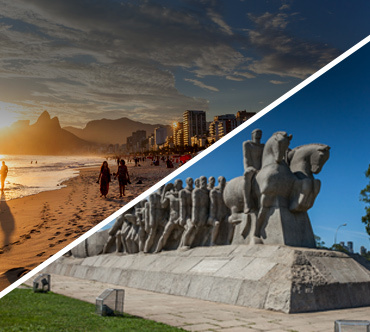 If you decide to take a bus to Sao Paulo, distance and time of your trip will depend on where you are coming from, the bus company and route chosen. 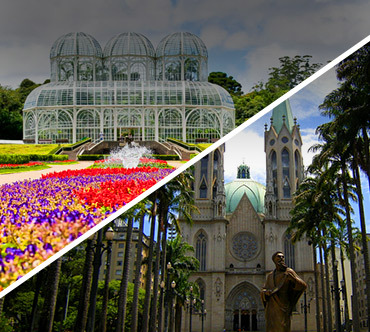 However, since Sao Paulo in a very popular destination, you can easily find buses heading to the capital city and book your bus tickets with plenty options of time, bus class and bus types. Sao Paulo has three bus stations that receive and send buses to different areas in the country: Tiete bus station, Barra Funda bus station and Jabaquara bus station. • Tiete Bus Station: Located on Cruzeiro do Sul Avenue 1800 in Santana neighborhood, is considered the biggest bus station in the country, it receives more than 90,000 passengers daily and has 67 bus companies operating. Tiete station covers almost all regions of the country and has international routes to countries like Argentina, Paraguay, Uruguay, Chile and Peru. The bus station also provides other services such as parking, tour desk, luggage storage, exchange point, cafes and restaurants. The terminal operates 24 hours a day and if you need any help or advice from the bus station, you can always call to +55 (11) 3866-1100. • Jabaquara Bus Station: Located in Rua dos Jequitibas s/n in Vila Parque Jabaquara. It has five bus companies which operates 10 different tourist routes, on the coast of the state of Sao Paulo. So, once you've enjoyed Sao Paulo and its multiculturalism, you can travel by bus and see the beauty of the beaches of the state that are on average three hours from the capital. The bus station also provides other services such as tour desk, luggage storage, cafes, and restaurants. This terminal operates from 4:30 am to 1:00 pm and whenever you require information, you can call +55 (11) 5012- 22 56. • Barra Funda Bus Station: Located at Auro Soares de Moura Andrade Avenue, 664 in Barra Funda, the bus terminal has 34 bus companies operating 139 routes to more than 570 cities like Araçatuba, Iguazu Falls, Peruíbe and Itanhaém in 6 states of the northern, central-western, southeastern, southern Brazil and the bolivian city of Puerto Soares. The bus station also provides other services such as parking, tour desk, luggage storage, exchange point, cafes and restaurants This terminal operates 24 hours a day and if you need any help or advice from the bus station can call always at +55 (11) 3392-2110. Rio de Janeiro to Sao Paulo: Expresso do Sul, 1001, Itapemirim and Expresso Brasileiro are the bus companies responsible for the route The bus trip lasts around 6 hours and the buses departs from Novo Rio Bus Station and arrives at Tiete Bus Station in Sao Paulo. Due to the popularity of the route, the companies have buses available all day. Santos to Sao Paulo: The bus companies which operates this route are Cometa and Expresso Luxo and the trip lasts around 1h50min. The buses leave from Santos Bus Station and arrives at Jabaquara Bus Station in Sao Paulo. There are plenty of bus departures during the whole day. Belo Horizonte to Sao Paulo: Cometa is the company responsible for this route and the trip lasts around 8h40min. The buses leave from Belo Horizonte Bus Station and arrives at Tiete Bus Station in Sao Paulo and 11 buses leave daily. Florianopolis to Sao Paulo: Catarinense and 1001 are the companies responsible for this route. The trip takes between 10 and 12 hours, depending on the ticket and the company chosen. Buses depart from Florianopolis Bus Station and arrives at the Tiete Bus Station in Sao Paulo. There are 13 buses depart daily. Bus tickets to Sao Paulo Here at Brasil by Bus, you can book your bus ticket for more than 3.000 destinations in Brazil with the main bus companies in the country. Booking and cancelation are 100% online and international travelers can book it using their international credit card and passport number.